Happy Thursday everyone! Are you ready for a BRIGHT and HAPPY color challenge? 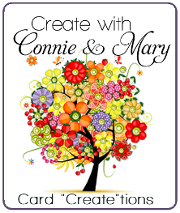 I hope so because we sure do have a BRIGHT and HAPPY one over at Create with Connie and Mary Thursday Challenge this week! Since I used Zoo Babies for my card set for Create with Connie and Mary Card “Create”tions 2014, I decided to use the set for my Thursday Challenge card. These little critters are just so cute! Tangerine Tango dsp (Brights dsp paper pack) – 3 3/4 x 3 3/4. Add to card base. Daffodil Delight – 3 5/8 x 3 5/8. Cut out the Starburst Framelit, run through the Alphabets Embossing Folder then add to card front using dimensionals. Cut out Whisper White circle and trim off one side to match up inside the Starburst opening. Add using dimensionals. Stamp greeting using Versamark on Gumball Green, White Emboss and cut out using matching Bubble Framelit. Add using dimensionals. 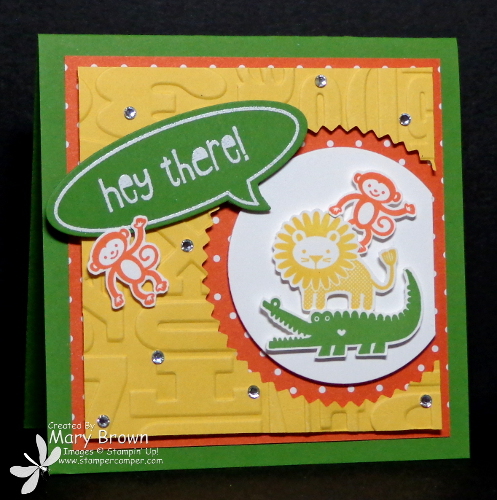 Stamp Alligator in Gumball Green, Lion in Daffodil Delight and TWO Monkeys using Tangerine Tango. Cut out and add using dimensionals. Add some Basic Rhinestones for that little extra bling. Check out what the rest of the design team did with this color challenge! This entry was posted in Create with Connie and Mary and tagged Just Sayin', Zoo Babies. Bookmark the permalink. So very cute! Love the monkey hanging from the word bubble! What a cute and creative card! I love the layering and embossing. THis Zoo Babies set is so cute, I may have to get it now after all the cute cards you have done! just bought zoo babies, like your cheerful card! Great idea to add the Alphabet embossing to the background. Love that little monkey hanging from the bubble. Adorable card, Mary. looks like we had the same idea on stamp sets this week! I love how you used the sentiments/word bubbles with the little animals – just darling!